science and technology since the late 1990s. The book is divided into three main areas.Chapters 1 to 5 focus on the basic principles of ultrasound and how the technology works on microbial cells, enzymes, and the chemistry behind the process. 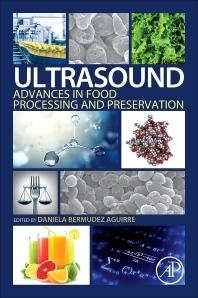 Chapters 6 to 15 cover the application of ultrasound in specific food products and processes, discussing changes on food quality and presenting some innovations in food ingredients and enhancement of unit operations. Finally, Chapters 16 to 20 present some topics about manufacture of ultrasound equipment and simulation of the process, the use of the technology to treat food industry wastewater, and an industry perspective. The laws and regulations concerning emerging technologies, such as ultrasound, are also discussed, including the new Food Safety Modernization Act. Daniela Bermudez-Aguirre received her Ph.D. in Engineering Science with focus in Food Engineering at Washington State University (WSU) in 2008. She worked at the same university as Postdoctoral Research Associate and she was involved in the development of several nonthermal technologies for food processing and preservation, such as high hydrostatic pressure, pulsed electric fields, ultrasound, ultraviolet, cold plasma and ozone. She also has experience working on thermal processing with multi-stirred mode retort. Her research at WSU included some projects funded by the Department of Defense (DoD) to improve the overall quality of military rations without compromising the food safety. Afterwards, Dr. Bermudez-Aguirre worked as a Senior Research Scientist for Lockheed Martin, a contractor of NASA. During her work at NASA Johnson Space Center, she developed functional space foods for the American Space Program and for long-duration space missions such as Mars. At the same time, she tested some novel technologies to disinfect and ensure the microbial quality of the vegetables grown and consumed in-orbit by the astronauts. She is author of more than 60 peer-review publications in international journals, edited books and conference proceedings. She previously edited a book in Food Engineering and she is currently reviewer of more than 45 high-impact journals in food science and technology. Her research interests include the use of novel technologies for product development and food safety.